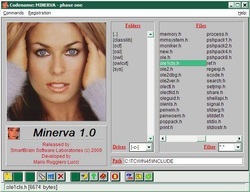 Codename: Minerva - phase one is a software designed to ensure confidentiality for any files by encrypting them according to a numeric key. File encryption is performed by two different algorithms. The first algorithm encrypts by replacing original characters with characters obtained by processing the encryption key entered by the user. Encryption key can contain up to 256 numeric characters. The second algorithm is developed after the first, the difference consist that the encrypted file characters are displayed in numeric format, therefore, the resulting file will be about three times larger than the original. It is obvious that the program has the appropriate decryption functions for the two types of encryption. Type encryption algorithm is automatically recognized by the application (after extension *.MV1 or *.MV2) and decoding is performed under appropriate routine. File decryption occurs regardless of the correctness of the key inserted, but if it does not meet the original, the operation is unpredictable and the resulting file becomes totally unusable.